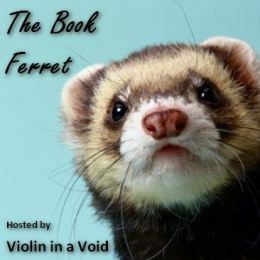 The Book Ferret is a weekly feature on Violin in a Void that will showcase a cool or interesting book-related find every Thursday. Notable new releases, great bookshops, events, cover art, websites, gadgets and accessories – anything to make bookworms happy. If you want to join in, grab the Ferret pic, link it and your post back here, and add your name and URL to the comments. Topic of the week: BOOKMARKS. I love bookmarks. I usually have more than one, which I alternately use them depending on my mood =) Currently I have 3, I have no idea where the others go (I’m such a clumsy person, I tend to lose them after a while). Right: A free bookmark received from a local bookstore. The design is simple and it bears this quote: “Just the knowledge that a good book is awaiting one at the end of a long day makes that day happier.” [Kathleen Norris]. Keychain - psh,if it works, why not? I've used thin books as bookmarks in thick books (although this tends to happen when I'm falling asleep and am too lazy to get anything else). I like the carpet one too! Cloth bookmarks are cool - they don't get creased in your bag. Heh, I kind of like that one with the ring. Nina: We should try to make one of those monster bookmarks. I don't know how's mine gonna turn up, though. I have no artistic eye at all! And it's amazing we bought the same book! We could compare reviews :D I've got a huge TBR pile so I'm not sure about doing a review before you, though. Hi! Found you through Follow Friday - I hope you're having an awesome weekend. I'm definitely following your blog for more, and I love that blog design - it's adorable!